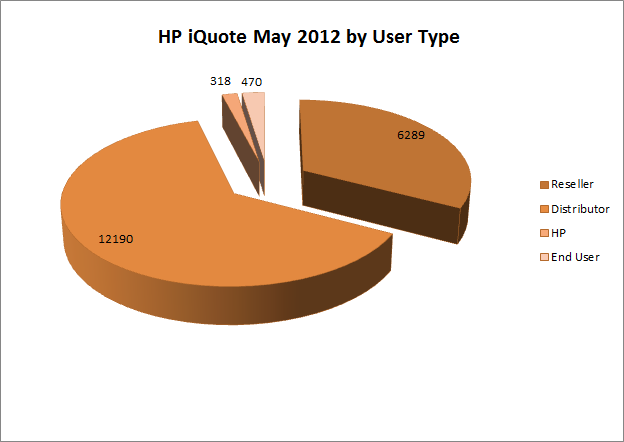 770 Unique Companies accessed HP iQuote with an average of 2 Users per Company. 19,267 New Quotes, 5592 Saved Quotes, 2925 Fully Exported (excludes Copy to Clipboard). Saved Quote value was $38.4M, Exported $15.7M and nearly $1.4M were sent to Hosts as orders from HP iQuote directly. Lastly, Distributor staff remain the bulk of utilisation but Reseller staff is a growing segment. Some HP use and very new: End Users accessing HP iQuote.